Small businesses are the backbone of the UK economy and HMRC has been transforming the digital services and support offered to small business over the last 5 years. An online business tax account allows you, a small business owner, to view all your tax needs in one place. You can register, file your tax returns and pay any tax online. There are also online FAQ’s and support to help you understand and use this online tool. A new feature starting from April 2017 will allow businesses to apply from their account for a little extra time to pay their tax bill. HMRC has a sizable collection of live and pre-recorded webinars that explain a large range of important small business issues. These can be viewed via any internet connected device i.e. a laptop, PC or Smartphone 24/7, making them both convenient and cost efficient. By using HMRC’s E-learning platform, you will be able to learn about important tax matters that are specifically tailored to small businesses. This series is interactive and may be a better resource for those starting their business for the first time. The email services that HMRC offers, allows you to receive emails specifically personalised to the tax account that you are registered for i.e. self-employed, or company VAT registered. It is simple to sign up for these reminders via an online account. A Twitter account and YouTube channel have been set up to support small businesses. HMRC’s Twitter accounts are @HMRCgovuk and @HMRCbusiness. The HMRC YouTube channel has loads of helpful videos which are tailored to guide and support small businesses. iForms are compatible with Smartphones and the progress of your enquiry can be tracked via your online tax account. HMRC have a list of Approved Apps that can help small businesses with digital record keeping. This online tool known as the Ready Reckoner and can be used by small business owners who are self-employed. It allows you to calculate the amount that you need to set aside each month to budget for your self-assessment tax bill for the upcoming tax year. HMRC allows you to pay for many services including paying your tax bill online using a debit or credit card. 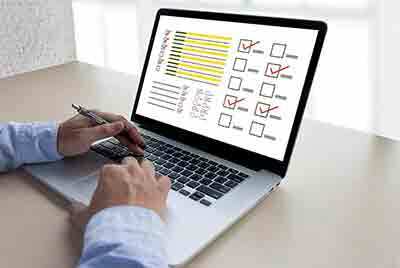 Tax agents who offer advice and complete tax returns for small businesses and self-employed parties are supported by HMRC via several online tools. These include Working Together, Agent update, Talking points, Tax Agent Toolkits. HMRC will ensure that tax matters for small businesses will be almost completely digital by 2020. Apps and software will be available that will aid small businesses to keep digital business records and complete digital reporting to HMRC. There will be online and phone support given over the transition period to ensure that small businesses can get prepared for this new initiative.